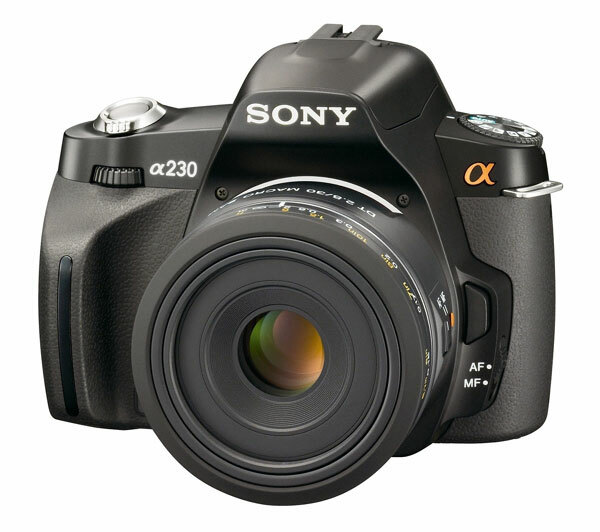 Sony released three new entry-level Alpha digital SLR models yesterday – the Alpha 230, Alpha 330 and Alpha 380! 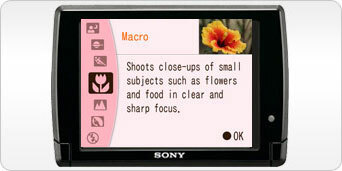 The Sony SAM 18-55mm F3.5-5.6 DT focuses to 25cm close and gives 1:2.94x maximum magnification. The Sony SAL 18-70mm F3.5-5.6 DT focuses to 38cm close and gives 1:4x maximum magnification. I like how they made the design very streamlined; the Drive and ISO buttons are gone, moved to the keypad; the AEL button is unfortunately gone (though very few understand it, and EV compensation works as well.) I suspect that the relatively “Slow Navi” of the A200/A300/A350 series has been replaced as the buttons have been reworked. There are clear explanations on screen about what each mode does. Ah, built in help! And yes, you can choose background colors for the pink lover in you. Interesting that there is a light meter on the right of the screen, to auto-adjust brightness in different conditions. The frame rate for all three cameras are now 2.5 FPS and 2.0 FPS in Live View where applicable. 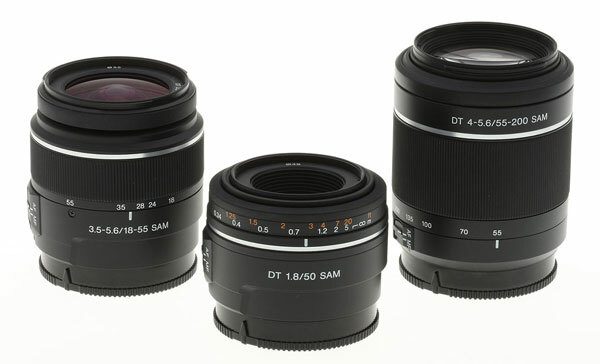 What is very exciting about the SAM 50mm F1.8 DT, is that it can focus to 34cm close! This gives a decent 1:5x maximum magnification. 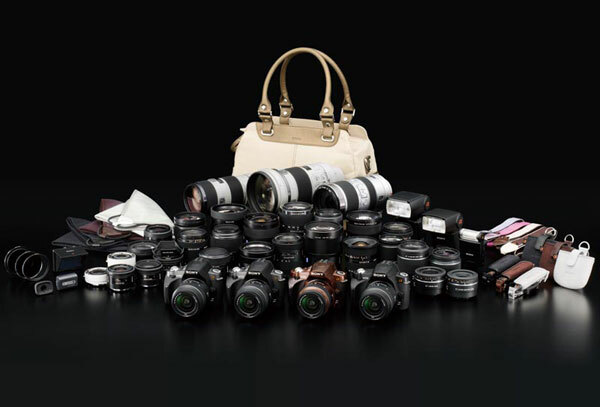 All other autofocus 50mm lenses that are brighter than F2.0, can only focus to 45cm close! This is a new record, which I am glad that Sony beat! The 55-200mm seems unchanged with the previous SAL 55-200mm F4-5.6 DT, still focusing to 95cm close and giving a 1:3.45x maximum magnification. 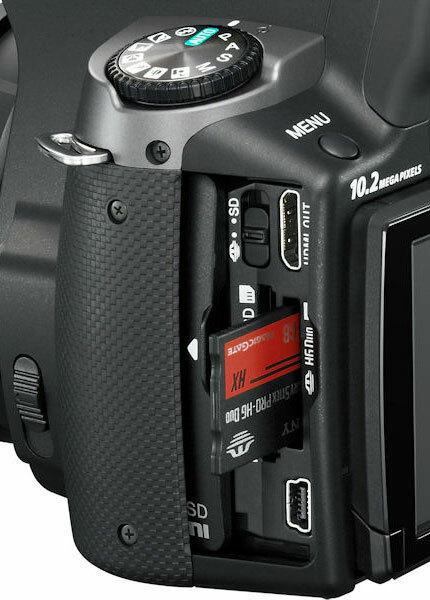 Interestingly, the CF card slot has been removed, and in its place, a Memory Stick HG Duo slot and a SD/SDHC slot! There is also a USB Mini-B port, instead of the USB Micro-B port on all previous Alphas which was a lot rarer. There is also a HDMI port and a MS/SD switch. Accessories! That’s a new bag in the top-left corner; the transforming, LCS-WR1AM wrapping cloth in the top-right corner, pouches for lens caps in the bottom-right corner, a magnifier loupe, the new NP-FH50 (shared with Handicams and the Sony Cybershot HX-1), a little pop-up screen protector good for viewing in sunlight, and of course the grip straps. Yes, a funky wrapping cloth! 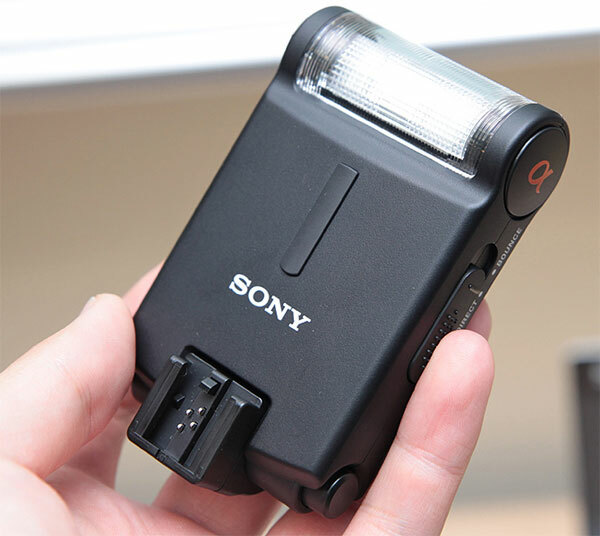 Oh, and of course this cute little thing, the Sony HVL-F20AM – a new tiny flash to complement the A900 which has no pop-up flash. In other words, a pop-up flash that can be removed, and can rotate upwards for bounce mode. Exactly what I wanted! 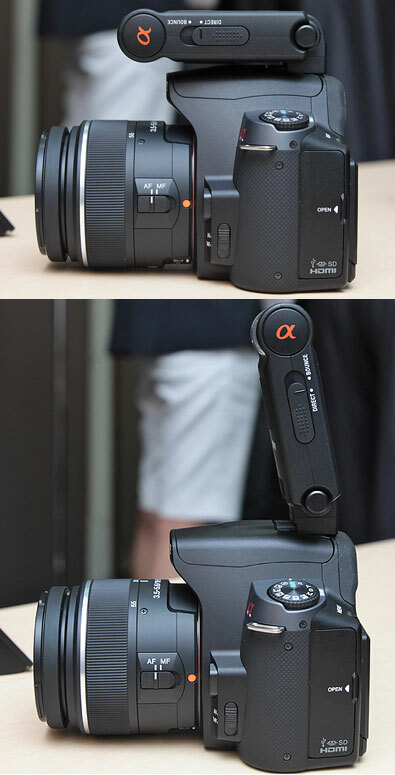 To add to that, when on the A900, it can be used as a wireless controller! 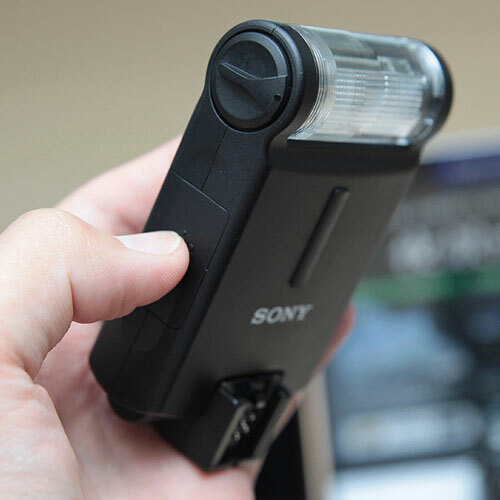 That’s all Sony literature says – whether it will also work as a wireless controller on the KM5D/KM7D/A100/A200/A230/A300/A330/A350/A380/A700 is not known. I am already looking forward to putting this on the A900 as a main bounce light, with my F58 and F42 making two hair lights. The flash turns on when you pull it up, and turns off when you push it down. Unfortunately though, this uses 2 AAA batteries instead. Fortunately the batteries I got for my Sunpak PF20XD are still full of charge! And this is a whole family lineup. 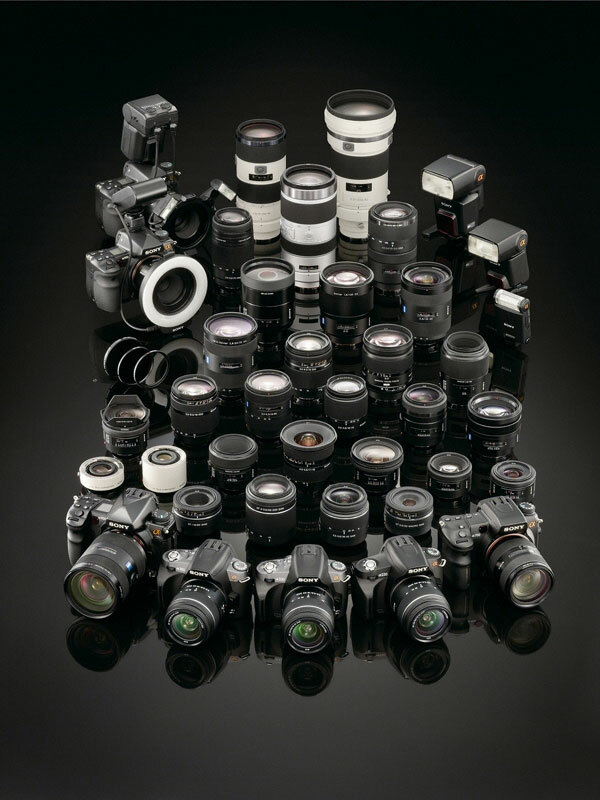 Interestingly, the Sony 24-105mm F3.5-4.5 is omitted from this lineup! So we don’t know if it’s discontinued or not. 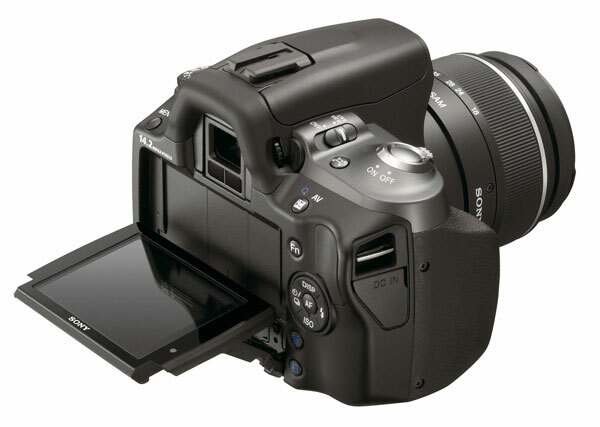 The Sony 16-105mm F3.5-5.6 DT only sits on the A700 instead of standing by itself. The original Sony 55-200mm F4-5.6 DT seems to be omitted as well, although the old Sony 18-200mm F3.5-6.3 DT is still in the picture! Now here’s the Japanese lineup – it comes with a ladies’ bag! 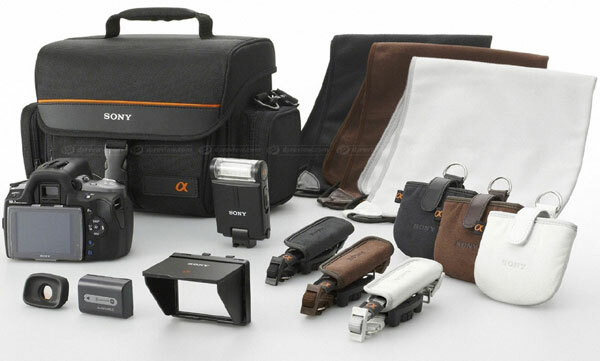 Yes, Sony sells a bag to go with your camera! Pictures are all taken from Imaging Resource, Sony’s virtual press kit, DC Watch and DPReview. This entry was posted in Geek, Pictures on May 19, 2009 by 2konbla. I&quot;M WAITING FOR AN UPGRADE FOR @700 Laaaaaaaaaaaaaaaaaaa! Holy cows! 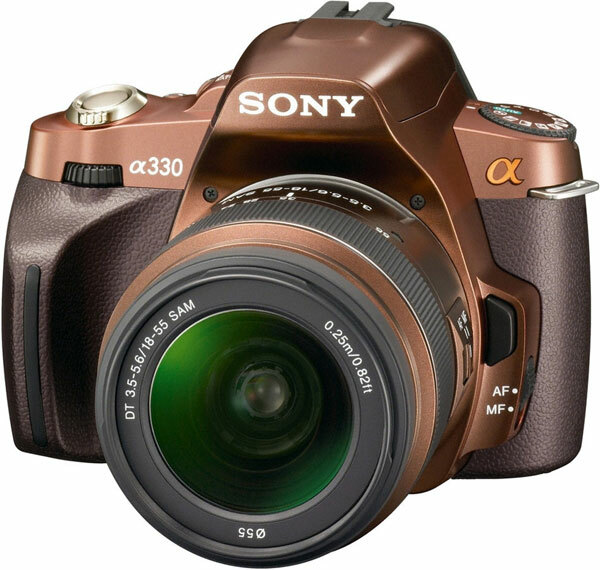 The more I see sony’s line of DSLR, the more I’m actually thinking of switching! &gt;_&lt; (no I must remain with the dark side!!). The Sony HVL-F20AM is definitely a good idea! 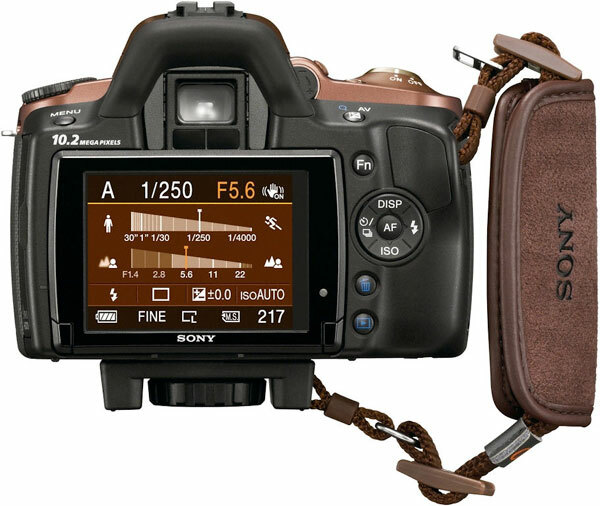 Nikon has one I believe call the SB-400 but it stands pale in comparison with the Sony HVL-F20AM shown here! 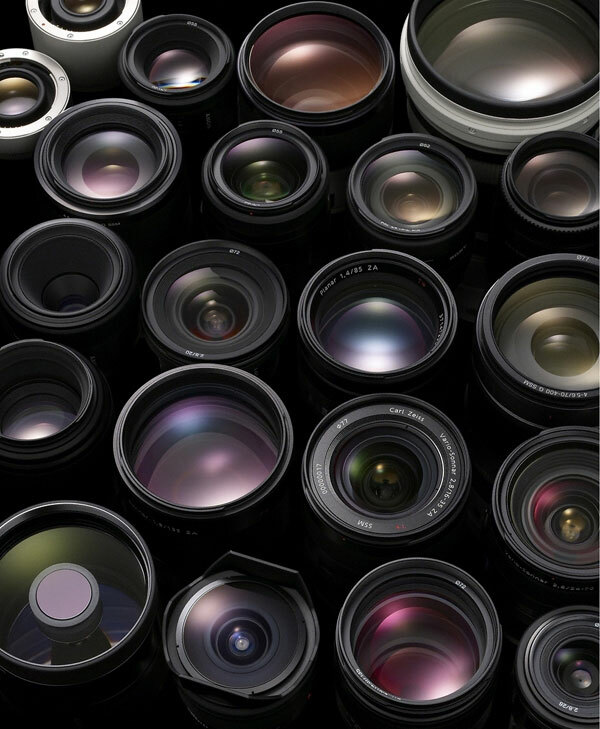 cant wait for the 50mm~!!! Though I never see the SB-400 around, for some reason. william: Me too, can’t wait to see how it is! Nicholas.C: Why are you looking there LOL. wonder what is the function of the funky wrapping cloth? flysheep: Apparently, to protect the camera. Should be interesting to see once a video is out.